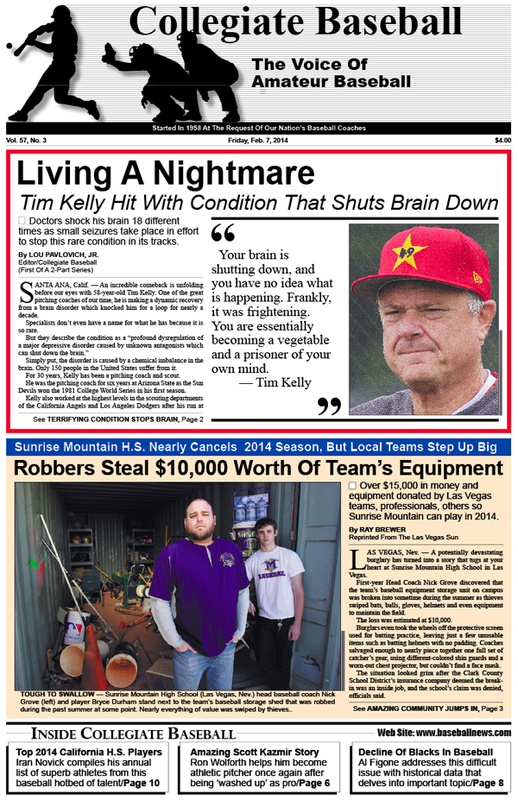 • Former ASU pitching coach and pro scout, Tim Kelly, is fighting to come back from a brain disorder that left him unable to function for nearly a decade. This story is the first of a 2-part series on Kelly. • Local teams step up to help Sunrise Mountain H.S. (NV) Miners after burglars steal their equipment and nearly force the cancellation of their 2014 season. • NCAA Division I baseball has history in the making this season with four pitchers who can reach 100 mph on the radar gun. • A wild lawsuit takes place after a Lakeside (CA) Little League coach decides to sue a player over a freak accident. • Rules Consultant Rich Marazzi reviews some of the interesting plays of the 2013 Major League season. • Pitching Coach Ron Wolforth discusses how he aided the comeback of Major League pitcher Scott Kazmir. • Santa Ana Junior College Head Coach Don Sneddon, the winningest skipper in California community college baseball history, resigns to become manager of the Modesto Nuts, a Colorado Rockies minor league team. • Charlie Greene discusses the importance of teaching throwing skills. • Al Figone gives the history of blacks playing in baseball and how the numbers have declined over the past 12 years. • Iran Novick presents his 2014 list of top California high school players. • The University of Tampa takes a trip of a lifetime to play in Cuba. • Two new books — The Complete Handbook of Coaching Catchers and Baserunning — are reviewed. • Editor Lou Pavlovich Jr. revisits some of the unusual and wacky players he has interviewed over the years including a pitcher who was a true flame thrower artist at South Carolina, another pitcher who was simply bizarre at Wichita State and another athlete who played baseball without any legs. • Hall of Fame Coach Skip Bertman of LSU explains how to call pitches with his unique insight. • Hitting guru Mike Epstein gives tips on how to refine a batter’s approach at the plate. • Catchers have constant micro trauma to their hands that can cause problems over time, and there are easy ways to reduce the problems.